Although this model seems to make intuitive sense, it is wrong—or at least, incomplete—in a very important way. To see that, think about what happens when you have a lot of experiences in the same essential situation. For example, you may have been fishing hundreds of times. If so, you will have experienced many different episodes in which you learned important things. So what happens when you go fishing again? Do you remember all of these episodes at once? If so, how do you manage to mentally process all those memories rapidly enough to extract and use the knowledge they contain? This issue has been referred to as the “paradox of the expert”—the notion that an experienced person might have so many relevant memories that she would be paralyzed by the effort to make sense of them all. The label is meant to be tongue-in-cheek, because of course real experts are not paralyzed in this way. The question is, why not? The answer lies in something that psychologists call a schema. A schema is an organizing structure in memory that collects the set of things you should expect in a particular kind of situation. So for example, if you have been fishing a lot, you will have a fishing schema in memory that amalgamates all of the things you have learned from all of the fishing experiences you have had. For example, you may remember which spots are best to fish from, which kinds of fish you are most likely to catch at different times of year, what kind of bait works best for each kind of fish, and on, along with miscellaneous details such as remembering that you should stay out of the water in the winter months, and that if you leave your bait unguarded a raccoon may steal it. By collecting this knowledge in one place, the schema helps you avoid the paradox of the expert. The simplest model of how schemas are built is that they are based on the first episode of a particular sort that you experience. So for example, the first time you went fishing, you created a schema for this new experience that basically told you to expect everything that happened this first time to happen every time (this is a little oversimplified since you probably would have understood you first fishing trip in terms of some pre-existing scheme—your schema for hunting, for example—but I’ll ignore this detail). From there, your fishing schema gets refined and amended whenever you learn something new from a fishing trip. This raises the quexstion, how do you know that you are learning something new? The answer is deceptively simple: you know you are learning something new when the expectations provided by your schema fail in the current situation. For example, suppose that your fishing schema includes the expectation that when there is ice on the river, you can cut a hole in the ice and fish through it, but that on this occasion the ice cracks and you fall through. Your expectation that you can fish through the ice has failed. But simply removing this expectation would be too extreme, because sometimes you can fish through the ice; sometimes you can’t. To create an appropriate revised expectation, you have to explain the why this works sometimes but not others. Then you can revise your expectation—for example, to note that you can fish through the ice as long as it is thick enough to support your weight. So expectation failure—the failure of your schema to accurately predict what is going to happen—is the trigger for learning. This is not exactly obvious, but if you think about it you can see that there really is no other way it could work. After all, when your schema tells you exactly what to expect in a situation, what is there to learn? It’s analogous to a scientific theory, which, if confirmed by experiment, remains unchanged, but that must be modified when a violation occurs. This is of learning from expectation failures, by the way, is where the notion of “surprise” comes into the picture. As I noted above, surprise and emotion are the two features that tend to make an episode stick in memory. It is interesting to note that surprise triggers the production of the neurotransmitter dopamine in your brain, and dopamine has the effect of strengthening the active connections between your neurons. This is thought to have the impact of making it more likely that you will remember in the future whatever it is that you are thinking about now. Emotions—especially pleasure and pain—also trigger dopamine production. So there is at least a plausible neurological theory of how surprise and emotion determine what you remember. By repeatedly experiencing and explaining expectation failures, you create progressively more sophisticated theories over time. Think, for example, about how you learn to get along with a particular person over time. At first, your schema for interacting with them may be more or less a copy of your generic schema for interacting with anyone. But over time various expectations in that schema will inevitably fail. To take a simple example, you may have a supply of jokes that make most people laugh, but you may discover your new acquaintance doesn’t find those jokes funny. From other interactions you may decide also decide that this person is quick-tempered, or sentimental, or iconoclastic, or shy, or any of a hundred other things. These hypotheses allow you to replace very specific expectations—say, that person X doesn’t like your joke about the three Neanderthals that walk into a bar—with a much more general expectation, for example, that person X doesn’t like anything having to do with negative stereotyping. As I noted above, the theory of how this kind of reasoning works is far from worked out scientifically. The key point to hang onto, though, is that explanatory reasoning is triggered when an expectation fails. I want to make one other quick point about this. You might ask why, if a person knows enough to explain an expectation failure, they wouldn’t have anticipated that failure in the first place. The answer is that expectation failures tell you what to focus on. I’ll give a quick, slightly silly example from a more modern, though still somewhat ancient era: my graduate school career. During this time, I sprained my ankle playing football and ended up on crutches for the first and only time in my life. As you might imagine, there was a lot to learn from this. One thing I learned quickly was about getting sodas. It was my habit, when I got my daily diet coke out of the soda machine in the lab building where my office was housed, to pop the top immediately and take a quick drink. The first time I did that on crutches, I soon realized that now that the soda was open, I was not going to be able to get it back to my desk without spilling it all over. Notice that while I could in principle have figured that out in advance, it was actually pretty unlikely that I would happen to think of it. Once the failure focused my attention, however, it was trivial to understand what was wrong. That’s why expectation failure in general plays such a vital role in learning: expectation failures show you where to focus your thinking in order to improve your understanding. First, when you do something and the expected result doesn’t occur, that almost by definition means that one of your goals is thwarted. That, in turn, as I discussed above, means that you are more likely to learn and remember the lesson that when your goals are unaffected. Third, to make a decision, you have to settle on a theory of what you expect to happen, even if it is only a wild guess. When you are just observing, you don’t have to have any theory at all. So, for example, when you watch someone fish you don’t need to think about how hard they should pull on the line once they get a strike. But when you are fishing, you are forced to make some kind of guess about this, and your guess will be either confirmed or refuted by what happens next. In other words, your guess becomes an expectation, which, even if wildly off base, can start you on the cycle of expectation failure and explanation that will lead you to a better theory. In other words, we start with a goal we are trying to achieve, we experience an episode in which we are trying to achieve that goal, we are forced to make a decision about how to address the goal, and that decisions is based on expectations that may fail and require fixing. Of course, this model is really a cycle–we would go around the cycle numerous times in any complex situation, pursuing multiple goals, making multiple decisions, and so on. There are a number of things to say about this model, but probably the most important is that in this model we learn by interacting with the world and refining out expectations about it, especially in the course of practicing the skills we need to learn. This model looks nothing like a lot of what goes on in a typical classroom—there is no room in it for lectures or for rote learning. The appropriate role for a teacher based on this would be, first, to ensure that this sort of experience occurs, and, second, to be the coach when an expectation failure occurs. Give the learner a motivating mission (the goal). Put the learner in an appropriate context where he or she can act to achieve that goal in a realistic environment. Force a challenging decision that may lead to an expectation failure, then help the learner fix the expectation by explaining the failure. One is to show the consequences of the failure, which allows the learner to get feedback on what went wrong as they would in a natural environment. The other is to provide coaching, which helps the learner to understand expert theories and models that can help explain what is going on. If you agree with this model of how learning works, then this is the kind of training you should want to design. If you don’t agree… then it’s time to get to work on your own theory. The main reason, I think, is that instructional design is often seen as a kind of trade, almost like, say, plumbing. No one expects plumbers to be whizzes at hydrostatics. Similarly, a lot of instructional designers seemingly prefer to be left alone to get on with their work without having to be responsible for messy theories of how the brain works. The problem is that learning is not a solved problem in the sense that building construction is. Following standard practices in the construction industry gets you a building that works; following standard practices in instructional design often gets you a course that doesn’t. To do better, I believe that instructional designers need to develop a better understanding of how learning actually happens, and use this as a guide to produce better designs. So in this column I want to do my part to to try to make that happen by giving my answer to the question, how do people learn? I want to begin by considering an example. Because I think discussions like this often go wrong from the start due to a modern tendency to see learning as something that happens in a classroom—and also just for fun–I’ve decided to set my example in a time before formal education. So, for the sake of argument, imagine that you are a homo erectus living in the Indus river valley in, oh, say, about 500,000 BC. Let’s say that you are walking home from the fishing hole in the twilight when suddenly, in a blur of motion, a tiger leaps from the brush directly into your path. There’s of course a good chance you won’t survive this encounter. In this case the removal of your possibly maladapted genetic strain from the gene pool may help your species adapt through natural selection. It’s cold comfort to you, but over time, as tigers take their toll, the surviving population will come to feature traits that are better adapted to a tiger-rich environment—being able to run fast, say, or being smart enough to avoid tiger-rich places and times. But let’s be optimistic, and assume you escape. In this case, there is better news: rather than sacrificing yourself to help your species adapt, you will instead get the chance to adapt as an individual. You can’t suddenly get faster, of course, or grow claws or wings, or anything like that. But you will change your behavior. For example, it is more than likely that you won’t dawdle at the fishing hole in the evening any more. You may choose a different path home as well. And so on. This is learning. The key to learning lies in your ability to remember your experience. You will remember the tiger episode for the rest of your life, and recall it at times when it may help you to make better decisions, like, perhaps, the next time the sun starts going down when you are at the fishing hole. As far as we know, if your brain is healthy, it records every episode that you experience, but only a fraction of those episodes seem to be remembered for the long term. A complete theory of what causes a particular episode to be retained in memory doesn’t exist, but two factors are known to have a big impact: surprise and emotion. Clearly, the tiger episode has plenty of both, which is why we can be certain that you will remember it. I’ll return to the issue of why surprise matters in a bit, but for now let’s think about why emotion would matter. The best answer seems to be that the things that evoke emotions tend to be things that effect, or threaten to effect, our goals, either positively or negatively. Encountering a tiger generates a lot of emotion because it threatens the goal of self-preservation. It makes sense to remember episodes in which one of your goals was threatened, because those memories can help you identify situations you want to avoid in the future. Likewise, it makes sense to remember episodes in which a goal was furthered—say, for example, a time when you tried a new fishing spot and caught an unusual number of fish—because those memories help you identify situations that you want to recreate. Now let’s think in more detail about what happens when you remember a past episode. First of all, it is important to note that due to a remarkable property of your memory, you typically recall past situations that are very similar to the one in which you presently find yourself. This matters because—at the risk of stating a tautology—you can expect similar things to happen in similar situations. If you go fishing, it makes sense to expect that it will be like the last time you went fishing; if you are headed down a particular trail it makes sense to expect it to be like the last time you walked down that trail; if you are talking to a particular person it makes sense to expect it to be like the last time you talked to that person; and so on. The notion that you are constantly recalling the last time you did something similar to what you are doing now seems obvious, but when you think about it, it is quite amazing that you are able to do this. Your memory for events is like a version of Google that actually works. If you observe very young children you’ll notice that they apply expectations from past episodes in a very simple and literal way—they basically expect their second experience in a particular situation to be just like the first. This can create an occupational hazard for parents. When my daughter was young, for example, I used to cringe whenever someone gave her a treat—at the dentists office, say, or at an event at a store or restaurant—because I knew she would expect the same treat the next time, and be unhappy when it wasn’t forthcoming. As people get older, however, they get more sophisticated about teasing apart the elements of a situation and hypothesizing their individual causes, and this complicates the picture somewhat. For example, if the last time you went fishing it was cold and there was ice on the river, you may be able to reason out that because it is warm this time, you should not expect ice. How exactly people do this sort of reasoning is a big open question—it’s the sort of thing I worked on when I was in artificial intelligence—but this shouldn’t obscure the essential fact that you remember past episodes and extract from them expectations about the present. Expectations are useful because anticipating something that might happen allows you to take action to ensure that that thing either does or does not actually happen. If you remember that the last time you walked down a particular trail you slipped on a mossy rock, for example, that allows you to step more carefully this time, while if you remember that the last time you went picking strawberries you found some particularly juicy ones in one corner of the patch, you can be sure to go straight to that place the next time. This takes us back to where we started, with encounters with tigers being one of the more obvious sorts of things you might want to avoid. In a manner somewhat analogous to a quality-improvement methodology like Six Sigma, NIIT’s proprietary Critical Mistake Analysis (CMA) methodology is based on identifying the most common and costly mistakes made by novices deploying target skills, performing a root-cause analysis to determine the underlying causes of these mistakes, and prioritizing training targets based on the business value of the potential improvement that can be made by addressing each. NIIT and Cognitive Arts have proven the value of this approach in numerous client engagements across a variety of industries and content areas through this award-winning methodology. 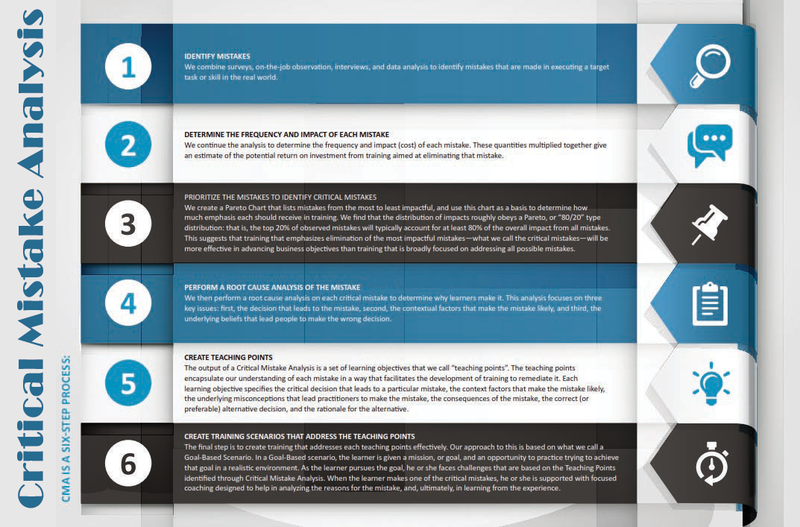 See info graphic for CMA’s six-step methodology for content development.